When you come in for care of your nerve system, one of the ways you know something is out of balance or “wrong” is if it hurts - pain, muscle tightness, spasm, cramping, tingling, and/or numbness. These are called “subjective findings” or symptoms - warning signs that the body has a problem. But there can be imbalances that do not produce pain symptoms. One of our best evaluation tools in checking your nerve system is the Subluxation Station, which is a series of 4 tests to evaluation the function of your nerve system. These test allows us to actually quantify how well your nerve system is working with no invasiveness at all. While symptoms are important, there can be an underlying imbalance in the nerve system long before you “feel” anything, and the imbalance can continue after you start “feeling” better. This exam lets us see objectively how the nerve system is working. We evaluate 4 different tests and come up with your “Core Score”- the average of all these test combined. The best you can score is 100! Let’s go over the reason behind each of the 4 tests. Hear Rate Variability (HRV) helps us determine your overall ability to adapt to the environment- how your body handles STRESS. Stress can be physical, emotional, chemical or nutritional- such as poor diet choices, heavy work schedule, emotional pressures …. The more stress your body is handling, the harder your adrenal glands and stress fighters work. The higher your HRV score, the better your body is at handling overall stressors. The ideal test result will put your results in the green target box. This is a balance between the parasympathetic and sympathetic nerve system- an imbalance of these 2 types of nerves will make your “engine” run to hard inside which can speed up the aging process. Range of Motion gives us specific digital values of your spinal muscle range in the cervical (neck), thoracic (mid back) and lumbar (low back) regions. 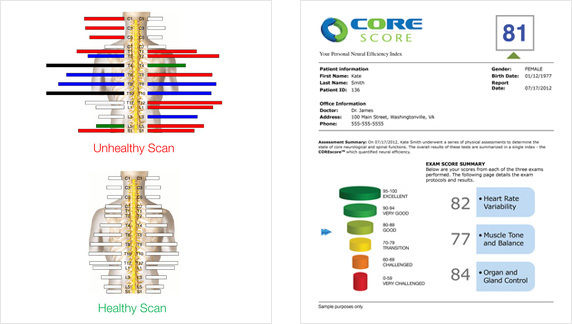 Restriction in motion help us determine areas in your spine that need correction and possible areas of subluxation. Surface EMG evaluates the function of the muscles that support and move the spine. The higher the score, the more efficient your motor nerves are supplying your spinal musculature. Overworked muscles due to accident, poor posture, daily stress or just simply being out of shape will lower your EMG value. As your test value increases, tension in your spinal muscles is released. Thermal Scan is used to assess the nerves that support your organs, glands, hormones and blood vessels. These nerves are part of the autonomic (or automatic) nervous system- the nerves that work automatically. You don’t need to ask your body to make your heart pump blood, or your lungs to breathe, or your stomach to digest your food. This all happens with the autonomic function of your body. The immune system is part of this autonomic system as well- it is measured in the scan by subtle heat differences in the skin along the spine. The higher the score, the better this autonomic nervous system is working. When you enter the office or have a significant change in your health, we perform these 4 tests to get your Core Score. It is a valuable test for children as well - when they have issues with ear infections, allergies, digestive disturbances… we can measure the efficiency of their nerve system - even a young baby. We typically re- scan your nerve system after 4-6 weeks of care and at the end of your acute care plan. Once you have achieved wellness care status, a scan once or twice a year is helpful to make sure all is working well in your nerve system. Early detection of small imbalances are more easily corrected- you may not even have symptoms in area we find positive findings. If you have any questions, please talk to us about your scan. If you have not had these scans in several months, please set up a time to do so – it takes about 20 minutes.